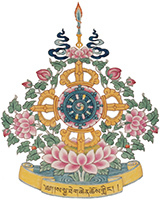 Join us from 11:15 – 11:45 am Seattle time for a 20-30 min Sharing the Dharma lecture by H.E. Dagmo Kusho Sakya. Prayers of the Three Long Life Deities is a text that we recite each Sunday at the end of Chenrezi. This book includes short prayers for the three long life deities: Amitayus, Usnisa-vijaya, and White Tara. Her Eminence Dagmo Kusho Sakya will tell us more about the prayers in this book, and their significance for our own lives.